Cape Town - The Springboks will field a new loose trio when they tackle Wales in Cardiff on Saturday. No 8 Duane Vermeulen and flank Francois Louw, who ply their trade abroad at Toulon (France) and Bath (England) respectively, are unavailable due to the match falling outside of World Rugby’s Test window. Siya Kolisi has returned to the side from paternity leave and is expected to take Louw’s place, while either Dan du Preez or Uzair Cassiem will replace Vermeulen. 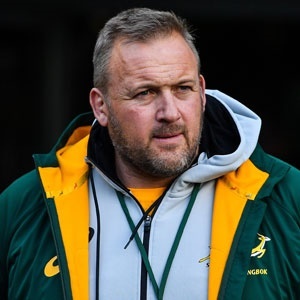 Springbok forwards coach Matt Proudfoot addressed reporters in Cardiff on Tuesday when he suggested the changes to the Bok loose trio will suit the conditions and opposition. Vermeulen and Louw relished last week’s wet conditions against Italy in Padova. Louw scored one of the Boks' five tries in a 35-6 victory, but this Saturday the South Africans face a different challenge under the Principality Stadium's closed roof. “The game against Italy suited Flo and Duane. Their physicality clearly came to the fore in wet conditions and on a narrow field,” Proudfoot was quoted as saying by SA Rugbymag. Proudfoot compared Wales' game style as being similar to New Zealand and Australia. Proudfoot did not say whether Du Preez or Cassiem will start on Saturday, but indicated that he has confidence in both players. The Springbok team will be named on Thursday, with Saturday's Test scheduled for 16:30 (SA time). It will be South Africa's final Test of the year and may be the last for Proudfoot and head coach Allister Coetzee. A recent newspaper report claimed that Coetzee will not survive when his contract is reviewed in December. According to Rapport, the performance clause in Coetzee’s contract states that he needs to maintain a 65% win-ratio and failure to do so would allow SA Rugby to relieve him of his duties without a so-called “golden handshake”. There were also reports that Coetzee was already in talks with Japanese club Canon Eagles regarding a head coaching position. The reports also stated that Proudfoot may join Coetzee in Japan, however the Bok coach strongly denied the claims.